Seen from Muscle beach to Golden Gardens, the activity that is crossing the nation is all about balance and core strength. What began as an activity for rock climbers is now a balancing act in local urban parks. 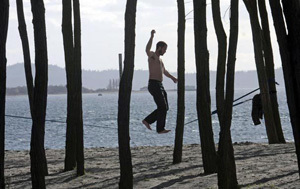 Slacklining, is a sport that uses nylon webbing stretched between two anchor points, typically from one tree to another. The line has a degree of slack in it, thus slacklining, making it different from tightrope walking. The longer and looser the line, the more challenging it becomes. Once you’ve mastered the basic skill, simply balancing on the line with two feet. You can work on mastering the skills of walking, turning and adding another person to the line. Why not give slacklining a try today! « This Blog is the First to Know!